Last week, Burien was hit with anti-immigrant messages targeting its sanctuary city policy. Downtown Burien, a suburb just south of Seattle. Police are looking into the distribution of possibly dozens of copies of a letter in Burien that encourages racial and ethnic violence, condemns immigrants and lashes out at the city’s sanctuary city policy. The typewritten letter, obtained by Crosscut, was left at Burien businesses and at local residences late last week, according to Burien Mayor Jimmy Matta. The letter says undocumented immigrants “are putting a burden on social services,” such as food stamps, or the Supplemental Nutrition Assistance Program, and Medicaid. “If there no ALIENS we would have our way of life restored,” the letter adds. Printed at the very top of the letter are the initials NBPP. The letter then lists the New Black Panther Party as the alleged authors of the letter before offering a phone number to call. It was allegedly signed by Hashim Nzinga, the group’s leader. 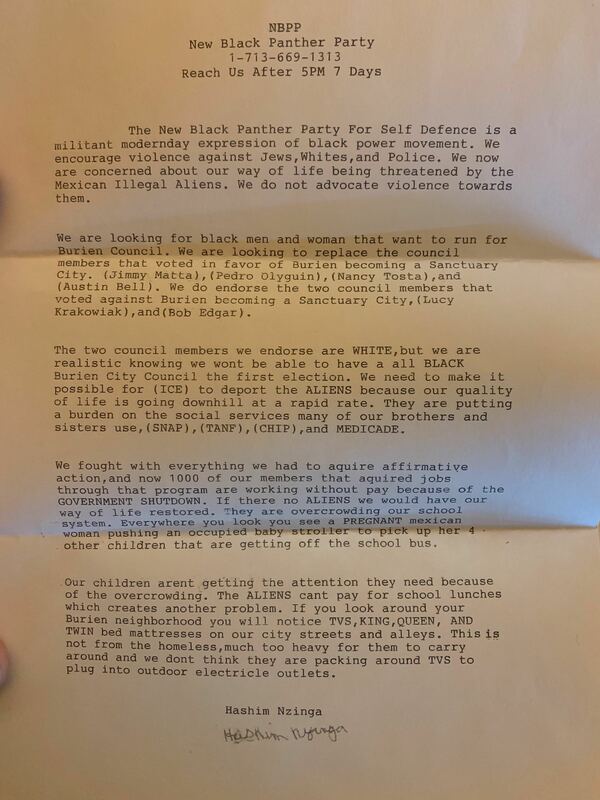 Jay Dizzle, regional chairman of the local chapter of the New Black Panther Party, said the Burien letter was not written by anyone in the organization. "We don't advocate violence," Dizzle said. "We definitely do not have any malice toward Brown and Latino people." Matta said no one seems to be sure who actually is responsible for the letter. “We’re not blaming anyone or pointing fingers,” he said. Matt Wendland, owner of the coffee shop Burien Press, told Crosscut he found the letter Thursday. Someone had apparently left it while he was in the kitchen, he said. The letter was stuffed in a white envelope with the initials “NBPP” written in thick, black marker. Wendland didn’t open the letter and read it until the following morning and then promptly alerted both Burien City Councilmember Pedro Olguin and Matta. Matta posted an image of the letter on Facebook. In an interview Sunday, he said the phone number included in the letter led to a Texas TV news station. He said he also did not know who had penned it. “It doesn’t mean it doesn’t have an impact,” he said. A copy of the letter that was circulated in Burien last week. The local chapter of the New Black Panther Party has denied any involvement in writing the letter. The Southern Poverty Law Center, a nonprofit organization based in Montgomery, Alabama, labels the New Black Panther Party “a virulently racist and anti-Semitic organization whose leaders have encouraged violence against whites, Jews and law enforcement officers.” According to the center’s website, members of the original Black Panther Party of the 1960s and 1970s have disavowed the group. This isn’t the first time a letter targeting immigrants has circulated in Burien. In 2017, Respect Washington, a statewide organization that the Southern Poverty Law Center has also labeled an anti-immigrant hate group, circulated a flyer with the names and addresses of alleged undocumented immigrants and the alleged crimes they had committed. Craig Keller, a Republican who ran for Congress last year against U.S. Rep. Pramila Jayapal, D-Seattle, founded the group. At the time, Keller was attempting to repeal the so-called sanctuary status of both Burien and Spokane by putting measures to roll back the cities' sanctuary status on their respective November ballots. His effort ultimately failed. The 2017 sanctuary city ordinance in Burien prohibits authorities from asking people about their immigration status. Experts say sanctuary cities are intended to facilitate cooperation between the police and undocumented immigrants and to ensure undocumented residents have access to some city services. Due, in part, to Burien's relative affordability, people of color have increasingly moved to the city. According to the 2010 Census, Burien is about 20 percent Latino. Less than 10 percent of the population identifies as Black. A flier was circulated pointing to the specific addresses of undocumented immigrants and describing the alleged crimes that they committed. Residents of the Seattle suburb react to the anti-immigrant flier that circulated. A group called Respect Washington is leading a statewide effort to repeal the so-called sanctuary status of Spokane and Burien. The letter advocates replacing the council members who voted 4-3 in favor of the sanctuary city ordinance, including Nancy Tosta and Austin Bell. But it also singles out Matta and Olguin, even though they weren’t on the council at the time the sanctuary vote took place. Only three Burien council members are up for reelection this year: Bob Edgar, Lucy Krakowiak and Bell. Bell voted in favor of the sanctuary city ordinance; Edgar and Krakowiak did not. Olguin said he knows the sanctuary city vote remains controversial. “I know that there’s still a group of people who have felt they have been slighted and not represented. They haven’t gone away,” he said. Alycia Ramirez, 27, found out about the letter through a private Facebook group. Ramirez also heard that the letter had been left outside Burien's public library. Although Ramirez doesn’t currently live in Burien, her husband works there and she still feels connected to the community after being involved in its sanctuary city debate. Ramirez identifies as African American. Her husband is Mexican. “Someone wants to make it known that people like us aren’t welcome in the community,” she said, though she added that she believes it’s only a minority of community members who feel this way. Wendland, the coffee shop owner, said hate would not prevail: “I think any group of people who are coming into Burien with the intention of dividing us, especially based on race issues, isn’t welcome here. I feel confident that the community will not tolerate that mindset or anything that is an attempt to intimidate or threaten community members here."